The 1978 success of John Carpenter's Halloween led to a flood of holiday/notable date-themed slasher movies, many of which were released in 1980 - there was Friday the 13th, Mother's Day, Prom Night, and more. 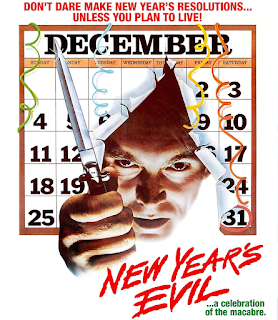 Among these holiday horrors was the Golan-Globus production New Year's Evil (set, of course, on New Year's Eve), which marked the feature directorial debut of Emmett Alston, who also crafted the story with writer Leonard Neubauer. 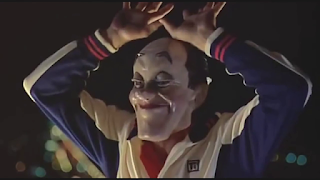 New Year's Eve is a surprisingly underused holiday in the horror genre. There's definitely room for more movies to be set on December 31st; if you want to ring in the New Year with an appropriately themed horror marathon, your options are slim. True. It's a shame. I do like Terror Train a lot, but other than that nothing else really comes to mind. New Year's Evil centers on a woman named Diane Sullivan (Roz Kelly), whose fans know her as Blaze, "The First Lady of Rock" and host of the Los Angeles-based music TV show Hollywood Hotline. Hollywood Hotline is apparently quite popular, given the fact that Blaze is going to be hosting a four hour live national broadcast of it on New Year's Eve, counting down the year's top new wave rock hits as midnight strikes in every time zone across the United States. Remote crews are filming celebrations in New York, Chicago, and Aspen so they can report in to her throughout the night. 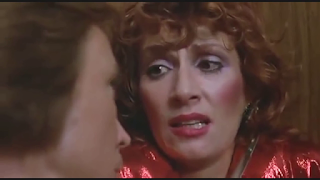 When I first saw this movie, the very first scenes showing Diane and her make up had me terrified. Even keeping the time period in mind, it's pretty scary. Her eyebrows are pink. Then I saw her dress, and the whole ensemble almost made sense. As the film begins, Blaze is getting ready for the show, going over the final details and wanting to see the press releases her publicist Yvonne has written up. Blaze's husband Richard is said to be holed up in Palm Springs getting loaded, but her son Derek (Grant Cramer) does show up to offer some moral support - and quickly regrets it. Blaze is so preoccupied that she completely ignores the good news Derek wants to share with her, breakthrough news regarding his acting career. If you needed more proof of how self-absorbed this woman is, look no further. Completely disregarding her son came quite naturally to her. Sure, he doesn't pick the best time to share with news with Blaze, but really feel for Derek when his mom is so blatantly ignoring him. Later he'll say he has something important to tell her and she'll brush that off, too. Derek is so hurt by his mother's aloof behavior that he stays in her hotel room and spirals down into madness while she hosts the show in the ballroom downstairs. He tries to call his father and can't reach him, he pops pills, and eventually he pulls a pair of his mother's stockings over his head and sticks a safety pin through his own ear, all the while talking to himself about the suspicion that he has a mental disorder. Derek will proceed to stalk around the hotel hallways, still wearing that stocking over his head. Although I have sympathy for him, the creepy "mom's stocking" stalking stuff is behavior I can't condone. Justifiable, though. Imagine growing up with a woman like that for a mother. The years of neglect are catching up to him. The Hollywood Hotline begins, but unfortunately, despite all the planning Blaze has done, there was one thing she didn't plan on: soon after the broadcast starts she takes a call from someone using a voice distorter and calling themselves Evil. Evil (Kip Niven) has a New Year's resolution he wants to share with Blaze: "I'm going to commit murder at midnight. I'm going to kill someone you know. Someone close to you." In a pre-title murder sequence, Evil actually already did kill someone close to Blaze, her publicist Yvonne (Alicia Dhanifu). That's why she never did get to see those press releases. Evil plans to commit at least four more murders during the night, claiming a life at the stroke of midnight in each time zone, building up to the murder of Blaze at midnight on the west coast. This is an unusual slasher, as it's Evil himself who gets the most screen time. Movies don't usually follow the killer as closely as this one does, we see all the steps he takes as he stalks North Hollywood for mostly random victims. I was a little shocked that they didn't try to go with a whodunit type of approach. Although it can be called unexpected, it can also be somewhat off-putting knowing who the killer is and seeing so much of him. For his east coast kill, Evil infiltrates the Crawford Sanitarium. This is something else different from the norm; horror movies usually begin with a killer breaking out of a sanitarium, not sneaking into one. What a weird choice. This guy is strange. Disguised as a male nurse and wielding champagne, he seduces a female nurse (Taaffe O'Connell) in record time, because on New Year's Eve, it doesn't matter how long you know someone before hooking up with them. Evil gets her into a private room so he can stab her to death at midnight - recording the audio as he does. Audio that he plays for Blaze during another phone call. I always find it funny how nurses look in movies like these. Has anyone ever been to a hospital? Nurses aren't allowed to dress like that, or have hair and make up done. They're nurses, not models. I'm almost disappointed that Evil's calls disrupt Blaze's show, because I enjoy seeing her host it like normal - she puts on this corny voice and delivers lines in a unique way. It's hard to describe in print, aside from the fact that she pronounces her own name like "Buh-laze". I want to see more Hollywood Hotline. Or Blaze doing a horror host show. I don't. I really don't see it with Blaze. I think she's not that great of a host at all. I don't get the hype. Donning a leisure suit and a fake mustache, Evil seeks out his Central time victim at a night club. He picks up Sally (Louisa Moritz), a woman from Akron, Ohio who came out to California and was dazzled by the sights. Now she's into all sorts of new stuff like transcendental meditation, transactional analysis, EST, zen, and haikus. Passing himself off as a business manager, Evil invites Sally to join him for a party at Erik Estrada's. As she considers it, another clubber bumps into her hard, and she decides to leave the place with Evil because "At least I wouldn't get crushed to death." Evil doesn't really hide his identity with the disguises he puts on, but it is interesting how different Kip Niven can look with minor changes. 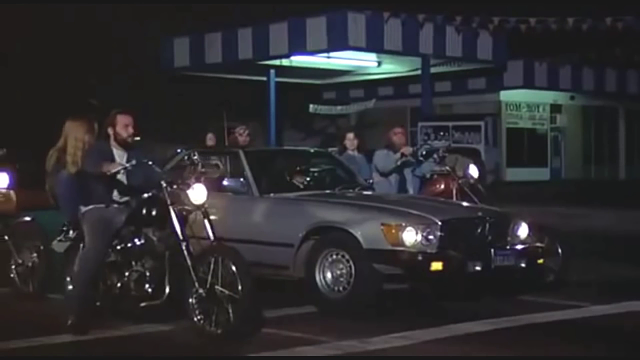 Sally brings her friend Lisa (Anita Crane) along as her chaperone, and the trio go for a ride in Evil's car - but they don't go to Erik Estrada's. Sally is killed at midnight CST, with Lisa dying soon after. Just when I thought Sally was acting like the typical dumb blonde, she surprises me by doing something smart. Bringing Lisa along turns out to be the only smart thing she does, though. Next up is Mountain Time, and as he sets out for this kill Evil puts on a priest's collar. 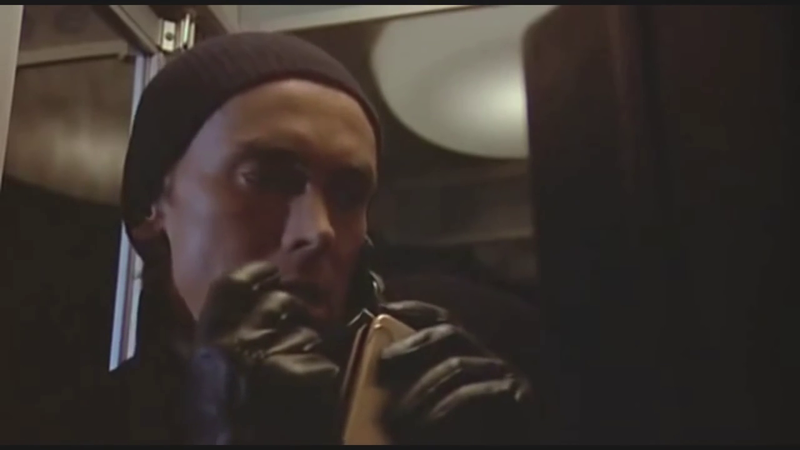 It appears that he's planning to kill a nun; he has a picture of one, and he's so distracted by this picture while he's driving that he ends up plowing into the back of some bikers that have stopped at a traffic light. This derails his plans, as the bikers start chasing him through the streets. This is my favorite part of the movie. Not only does the psycho killer get the tables turned on him and become the one being stalked, but it's by a biker gang - not because they knew someone he killed, but simply because of a traffic accident. It's an awesome and completely random turn of events that gets even better with the location the chase leads to. It's definitely the most interesting and entertaining part of the movie. 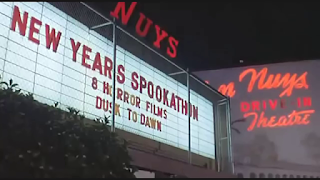 Evil seeks refuge at a drive-in theatre hosting a New Year's Spookathon, eight horror movies being shown between dusk and dawn. The bikers follow him, so he ditches his car, kills a biker that confronts him, and steals another car - one in which a teenage couple has been smoking pot, making out, and starting to disrobe. The boy bails, but the teenage girl (Teri Copley) is trapped in the back seat as Evil speeds off into the night. I want to go to a New Year's Spookathon! Drive-ins couldn't do that in my part of the United States, people would be freezing. I have been to some drive-in marathons, but never one with eight movies. They top out at five. Drive-ins aren't common here in Brazil. There used to be one in town but it closed decades ago. I've never been able to watch a movie in a car. The girl pleads for her life as Evil drives her off toward an unknown destination, and when he hits the brakes to avoid running over a couple drunks who stumble into the road, the girl takes her chance to escape. Evil pursues her through a park, but has to give up on the chase when he hears police approaching. The biker kill was too early to count - Evil's mission to kill someone at midnight Mountain time fails. Another different turn of events. You'd never expect the slutty girl to survive. It doesn't quite make sense to me that Evil would stop to avoid hitting the drunks. He's already killed five people in the last three hours, what does he care if he runs somebody over? Nothing he does seems to make any sense. He's a weirder type of killer dude than what we're used to seeing in slashers. His failure doesn't deter Evil from his ultimate objective of killing Blaze. Although she has been deeply disturbed by the calls, she has adopted a "the show must go on" mentality that the police have supported - they wanted her to keep the show going so Evil would keep calling and they would hopefully be able to figure out who he is. So between calls and reports that the police have found the bodies of Evil's victims, Blaze has continued introducing musical acts and dancing the night away. 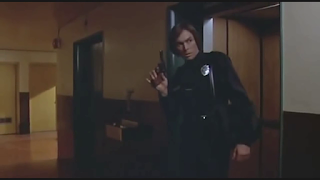 The movie is kind of insulting to fans of new wave rock; when the police first show up they basically tell Blaze "You brought it on yourself by playing that devil music" and put down the people in the audience... Several of whom are presented as being jerks, justifying the way the police look at them. Security at the hotel Hollywood Hotline is being broadcast from is extra tight. The number of police at the scene has been increased, and these guys are intense - they even nearly kill Derek when Blaze forgets he was in her room. But Evil still manages to sneak into the building, bashing a cop on the head and stealing his uniform. Ah... so this is why we get to see the killer throughout the movie. There is a twist! His identity. I can get behind that. The problem with Richard's plan is that he doesn't just attack her and get it over with, he gets overly complicated by messing with the elevator and monologues to Blaze so he can explain the motivation behind his killings: "Ladies are not very nice people. They are manipulative and deceitful and immoral and very, very selfish." He wastes time he doesn't have doing this, since the police have figured out that he is the top suspect. 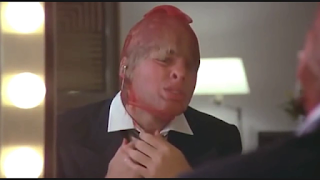 I watched a lot of '80s slashers growing up, but New Year's Evil wasn't one of them. I didn't see it until around thirty years after it was released, having sought it out because it was from my favorite era in a sub-genre I love. To be honest, I wasn't overly impressed with the movie the first time I saw it. I didn't really connect with it. It's a film that I have grown fonder of over years and multiple viewings. Same here. 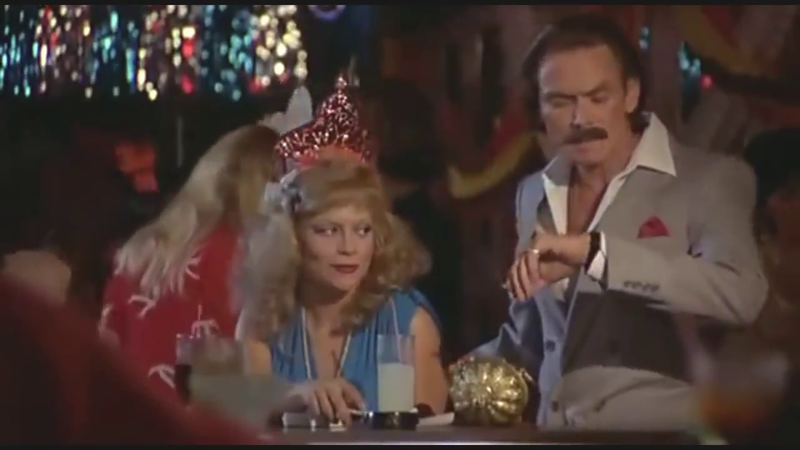 I had never watched New Year's Evil until Cody showed it to me last year. First viewing didn't leave me impressed either, but watching it a second time made me like it more. I still don't love it, but it's an okay slasher. I enjoy New Year's Evil due to its cheesy, offbeat style. The performances, like the way Blaze hosts her show, some of the goofy characters, dialogue, and scenarios. Derek's stocking freakout. The biker chase. It's an unusual film that throws some weird, unexpected things at you, and I appreciate that. The unusual and unexpected elements are my favorite thing about the movie. And there are plenty of those. Acting is alright, but Blaze just doesn't do it for me. I don't know if it's just the character, but I don't find her to be a likeable person. Couldn't really care whether or not she was going to survive. I'm not the biggest fan of new wave rock, I wouldn't say I like the songs in the movie all that much, but I find the way they're presented to be entertaining, and they help the film achieve its unique feel. One of the things I don't appreciate about New Year's Evil is the lack of Holidays' vibe. The band is the least holiday-ish one you could find. I know that portraying New Year's Eve is more complicated than other holidays, but still, the movie could have used some of it. There is some padding in there, but I like the pace the film moves along at. It has a very simple structure, cutting back and forth between Evil's progress and Blaze dealing with the situation at the hotel, and there are basically 20 minutes dedicated to each time zone scenario. You get the Eastern, Central, and Mountain sequences, then Evil gets into the hotel for his attempt to kill Blaze around the hour mark. Everything's all wrapped up in under 86 minutes total. The climax is slightly disappointing. If only Evil took a different approach to dealing with Blaze. It drags a bit toward the end, after Evil's true identity is revealed. And it also shows him too much. The kills aren't really impressive, I feel like that aspect could've been highly improved. Overall, I find New Year's Evil to be a fun viewing experience that gets more fun each time I watch it. I think it's a movie that fans of '80s slashers should see, and if you have seen it before and didn't like it I would recommend giving it another chance. Maybe it will grow on you. The killer is very confused. He said he'd murder people close to Blaze, but ended up only killing one person Blaze knew. Then he went back to the mental hospital, which is something he didn't have to, and most likely wouldn't. Then he's set on killing a nun. Very random, bizarre stuff. But if you can get past that, and the absence of a truly likeable final girl - in this case woman - the movie can be enjoyable.